It's not a great movie by any stretch, but I was actually really surprised by how much I enjoyed it. To be honest, I only checked it out because the director of Flip Flappers worked on it, and it kind of shows! There's lots of really awful cg plaguing most of the movie, but the 2D animation is consistently good, and the entire movie shifts to it for the last ten minutes for a really fun climax, and even before that there are some really cool scenes! As for everything else, uh... 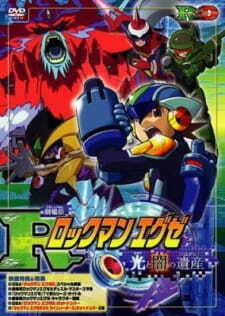 It's Rockman.exe. You don't exactly look to it for interesting stories with complicated characters. Basically, the most interesting character you can expect is Higsby. Basically, watch this movie if you like Mega Man Battle Network and you don't mind a bit of weird inconsistency in quality, because the lows of the movie are inoffensive and the highs of the movie are hilarious fun.